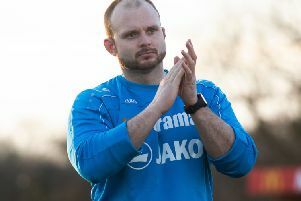 Hemel Town boss Dean Brennan felt his side’s victory over playoff chasing Truro City was a great advert for the National League South as Graeme Montgomery notched a brace to seal a 2-1 win for the Tudors. Montgomery’s double, either side of an equaliser from Dan Green, was enough to put an end to Truro’s long unbeaten run and fire the Tudors back up to eighth place in the table. “In the second half we really stuck to the gameplan and looked the better side, and I thought that we were deserved winners in the end,” said Brennan. “It was a good game and I thought Truro played really well, especially in the last 15 minutes of the first half. “Every game is a good test for the management team, the club and the players – sometimes we get it right, sometimes we get it wrong, and on this occasion we managed to get it right. “It thought the supporters were excellent and we gave them plenty to sing about, which is good. Sometimes we get it right, sometimes we get it wrong, and on this occasion we managed to get it right. Despite the victory putting the Tudors just four points behind fifth placed Truro – and extending their winning run to three games – Brennan dismissed the notion that his side are back in contention for a playoff place. “I don’t think we are in the playoff race because we haven’t got the squad,” said the Tudors boss. “We had two schoolboys on the bench again on Saturday. “We just keep taking it one game at a time because we can’t afford to look any further forward than that.